Comment Here for Lees Ferry Action Alert due 1/5/18! Today (Friday 1/5/18 at midnight) is the last day for you to comment on the National Park Service plan to eradicate Brown Trout at Lees Ferry. Please take a moment to make a comment...every comment makes a difference. Thank you for the opportunity to comment on this EA. Qualifications upon which my comments are based include my career as a full time fishing guide on the Colorado River since 1983. During that time I have spent more than 8,000 days or 80,000 hours on the river in pursuit of trout. By the way, during all this time on the river, I have seen two brown trout, both caught by my customers. I have logged in excess of 240,000 miles traveling up and down the Colorado River between Lees Ferry and Glen Canyon Dam. My job and success is totally dependent on my ability to provide fish to be caught by my angling customer. In order to do this successfully, I have to be a student of fish behavior, water quality and dam operations, aquatic entomology, weather and ichthyology. Additionally, I have written two books: The 50 Best Tailwaters to Fly Fish (which chronicles the 56 best tailwaters in North America to fish which goes into exhaustive detail on how and when to fish each tailwater and details the history and the ecology of each featured tailwater); along with The 25 Best National Parks to Fly Fish, which includes the Colorado River, Grand Canyon and Glen Canyon. I own and operate Lees Ferry Anglers and Cliff Dwellers Lodge. We are a large employer in a small community and provide both year-around and seasonal jobs to more than 45 men and women, primarily local. The operation of our business and employment of my staff is 100% dependent on a healthy Lees Ferry recreational fishery. For reasons that at this point can only be speculative, brown trout have recently become established in the stretch of river at Lees Ferry. Perhaps they have discovered it to be more suitable habitat than their previous range in the Grand Canyon where they have lived alongside native fish ever since the brown trout's introduction by the National Park Service in the early 1920's. The fact that brown trout are now seeking to live in area of the river that are as far away as they can possibly travel from native fish habitat is something that should be celebrated by all, some 60 to 75 miles! One of the things that I discovered in researching 50 Best Tailwaters is that virtually every cold tailwater in North America contains a healthy population of both rainbow and brown trout living in equilibrium; many have native fish as part of the mix. There are two other notable tailwaters in the western U.S. where brown and rainbow trout coexist amongst themselves and native fish; both the San Juan and Green Rivers are world famous trout fishing destinations. On each of these tailwaters, both rainbow trout and brown trout are part of the daily catch by anglers who travel great distances and provide a local economy that is based solely on the sport fishing industry that these tailwaters provide. Anglers on these two rivers and on other cold water rivers in North America place great value on being able to catch both of these trout species on the same body of water. I strongly urge the National Park Service to step back, take a deep breath, and look into the rationale for any brown trout removal measures at Lees Ferry. Furthermore, I implore the National Park Service to abandon all plans to remove brown trout from the Lees Ferry reach by electroshocking the river. It has been repeatedly proven in scientific studies that river-dwelling, non-anachronous-brown-trout do not move around in rivers. In fact, in numerous studies, displacement from established home ranges was not observed for any fish other than those spawning. So, the theory that brown trout might migrate 60 to 75 miles downstream, away from prime habitat, to potentially impact native fish populations is based purely on emotional speculation. This brown trout removal plan has no factual scientific basis whatsoever and to instigate a brown trout removal strategy at Lees Ferry based upon this premise is dangerous, irresponsible, and reckless and is likely outside of the NEPA planning process. The collateral damage to the Lees Ferry rainbow trout fishery from mechanical removal and the public perception it creates will decimate an already distressed economic community that has been impacted by dam operations including High Flow Experiments. In addition, National Park Service and Bureau of Reclamation opposition to actions benefiting the trout fishery (trout stocking) has resulted in ongoing damage to visitor use and experience and has had a deleterious socioeconomic and environmental social justice effect on the local community. It has been previously established that authority and control over the Colorado River fishery is the sole responsibility of the Arizona Game and Fish Department. For the National Park Service to make decisions and enforce actions outside of their authority and without the cooperation of the Arizona Game and Fish Department could be construed as to instigate an illegal "take" of sportfish. I know that this is an emotional issue. I'm sure that you have seen an outpouring of support for no action on removal of brown trout. Please consider each of these comments to reflect the desires and opinions of the people who actually utilize the resource and recreate there. Please do nothing to harm the fish, the resource or the local fishing-based economy. Plan only a course that will actually benefit the native fish, local recreation, and local economy. You’ve seen my recent outreach to Lees Ferry trout fishery supporters asking for personal comments to the National Park Service’s Extended Non-native Aquatic Species Management Plan Environmental Assessment (EA). Thanks to the many who responded by submitting comments opposing electrofishing mechanical removal of brown trout in the fishery. The Federal Advisory Committee group member representing Lees Ferry, GCDAMP Recreational Fishing, submitted detailed formal comments. Those comments are attached below this letter and consist of reasoned requests, thoughtful suggestions, and a statement on the Park Service's unacceptable proposal to initiate electrofishing mechanical removal to the detriment of Lees Ferry the trout fishery. Overall the response exceeded expectations from organizations, individuals, and businesses weighing in on opposing the Park Service. In an ideal world, the Park Service would respond to those comments positively by withdrawing electrofishing mechanical removal from the EA and presenting an acceptable EA not damaging to the trout fishery. Unfortunately, that may not be the case. Realistically the scoping comment submissions may only be Round One with more to come. Only the strength of numbers can push bureaucratic agendas back. With the support of the angling community and Recreational Fishing, we intend to press forward on all avenues available. As opportunities arise we will keep you informed and again be seeking your support. Please consider sharing this letter out to your angling friends and encourage their future participation in this challenge. Our great appreciation for all the support we have received for protecting the Lees Ferry fishery! We the undersigned are writing to provide comments on the National Park Service’s (NPS) Environmental Assessment (EA) for an Expanded Non‐native Aquatic Species Management Plan in Grand Canyon National Park and Glen Canyon National Recreation Area below Glen Canyon Dam. 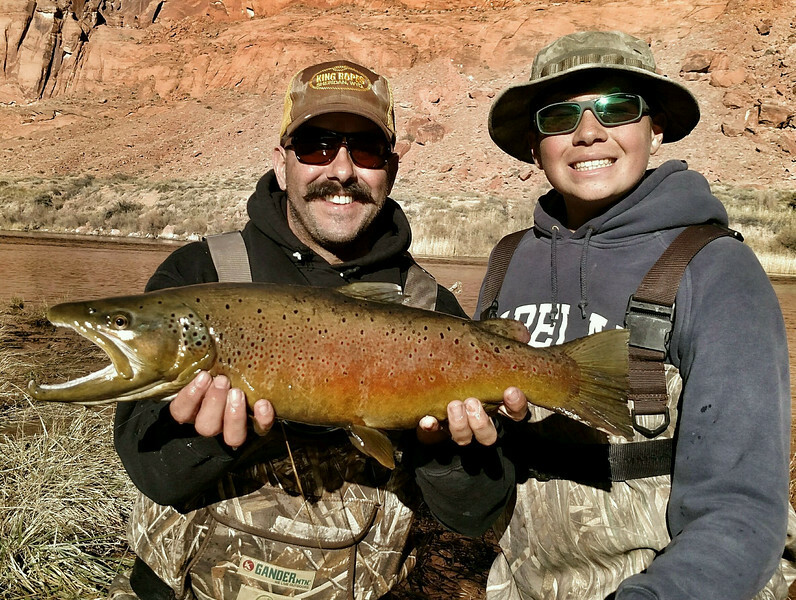 Since 1964, with the completion of the Glen Canyon Dam, the Lees Ferry tailwater has hosted a recreational trout fishery that has grown in importance and reputation locally, regionally, nationally, and internationally. This blue-ribbon recreational sport fishery has also become a financial and economic mainstay for the small community of Marble Canyon and Coconino County, supporting fishing guide services, hotels, restaurants, fishing and outdoor recreation equipment and supplies, and visitor services. Our comments are aimed at maintaining and enhancing a blue-ribbon rainbow trout fishery at Lees Ferry that does not adversely affect the native aquatic community in Grand Canyon National Park. While electrofishing has been effective for managing trout in small streams like Bright Angel Creek, there is no evidence that it will be effective for controlling brown trout in the mainstem of the Colorado River. Many more rainbow trout would be shocked for each brown trout captured. The focus of mechanical removal would be on shoreline areas that are also prime fishing areas. In addition to direct rainbow trout mortality, the behavior of salmonids that are subjected to electrofishing is negatively affected which would impact angler catch rates and satisfaction. The collateral damage to the Lees Ferry rainbow trout fishery from mechanical removal and the negative public perception it creates will significantly harm an already distressed economic community that has been impacted by dam operations. In 2017, the Secretary of the Interior signed Secretary Orders 3347 and 3356 with the purpose of increasing outdoor recreation opportunities, including hunting and fishing, and improving the management of game species and their habitat. Long‐term intensive and repeated electrofishing and trapping will negatively impact catch rates and potential population abundance of the rainbow trout fishery and violates the spirit and intent of the Secretary’s Orders. We believe that an Environmental Impact Statement (not just an EA) will be needed to fully evaluate the impacts of long term intensive mechanical removal in Glen Canyon. Rather than pursuing an unacceptable intensive mechanical removal effort, we recommend that the NPS pursue other more cost-effective and less damaging strategies such as a brown trout bounty program or making changes in Glen Canyon dam operations to disadvantage brown trout spawning or recruitment. The actions outlined in the EA will not achieve the Purpose and Need for the Project. A goal of the EA is “to allow the NPS to prevent, control, minimize or eradicate potentially harmful non‐native aquatic species, or the risk associated with their presence or expansion, in the action area.” This goal can only be accomplished by working with Bureau of Reclamation (BOR) to address the most likely root causes of the recent increases in the brown trout numbers in Glen Canyon e.g., rising warmer water temperature, sequential fall HFE’s. Actions to address the root causes, which are not addressed in the EA, may include shifting the emphasis of high flow experiments from the fall to the spring, implementing a temperature control device to regulate the temperature of water releases from Glen Canyon Dam, and/or testing the use of “trout management flows” to reduce brown trout spawning and/or recruitment. To address these actions NPS and BOR should work together as co-leads for this EA. The Arizona Game and Fish Department (AGFD) is the management agency with primary statutory responsibility for resident fish and wildlife in the State of Arizona. In September 2015, AZGFD approved its Fisheries Management Plan, Colorado River-Lees Ferry 2015-2025 (Plan). The EA should clearly state that the Proposed Action will only be carried out in coordination with and upon concurrence from the AZGFD. In summary, the NPS proposed intensive, long term mechanical removal action threatens rather than advances the goals of the NPS CFMP and the AZGFD Plan which is to manage a “for a quality recreational rainbow trout fishery within Glen Canyon National Recreation Areas (NPS 2013 and AZFGD 2015).” We look forward to your response to our comments.